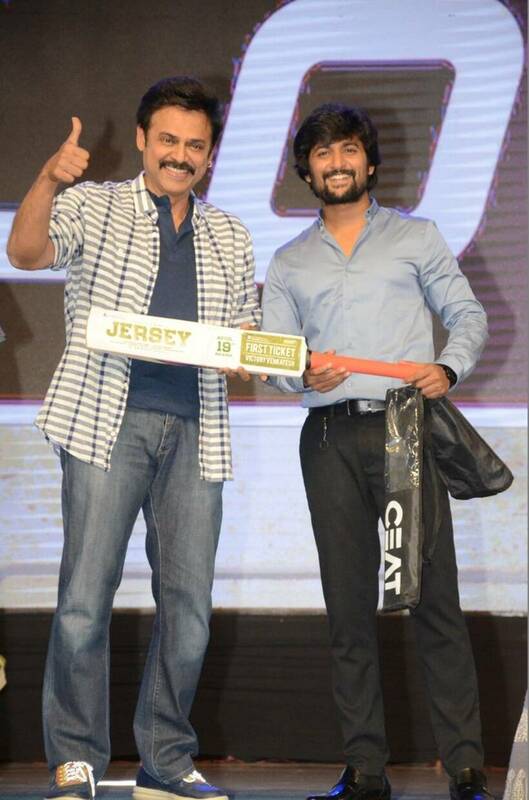 At an event on Monday, Venkatesh and Nani played cricket to promote the latter's upcoming film Jersey. Nani's upcoming sports drama Jersey is all set to hit screens on April 19. Ahead of its release, the actor organised a pre-release event which saw actor Venkatesh in attendance. Both Venkatesh and Nani played cricket on the stage. Fans also got a chance to win Jersey tickets at the event. Jersey also stars Shraddha Srinath, Sathyaraj, Brahmaji, Subbaraju, Rahul Ramakrishna and Sampath Raj. The film is said to be based on the life of former cricketer Raman Lamba. Jersey, written and directed by Gowtham Tinnanuri, is produced by Suryadevara Naga Vamsi under his production banner Sithara Entertainments.